Warrington head coach Tony Smith and Wigan counterpart Shaun Wane have both said they believe fair shoulder charges do have a place in rugby league. "If it's legitimate and isn't to an opponent's head or dangerous, it's part of our game," said Smith. 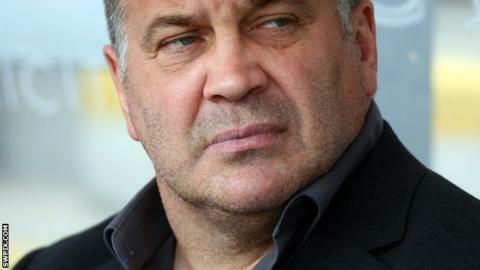 Wane added: "As long as it's body on body, I think it's fair game." The Wigan coach continued: "We don't practice it because it is not a good technique. We practice perfect technique here. "But I don't see a problem with it. I've seen it in the NRL for years and it's happened over here for years. It happened when I played." "The safety of the players is of paramount importance and I'm not necessarily against banning the shoulder charge because it makes the game safer. What I don't understand is why the Rugby Football League originally agreed that it was acceptable, having consulted with the players, and have now changed their stance three weeks into the new season. Ultimately, once the Rugby League International Federation banned it, the RFL were left with no choice but to follow, otherwise they would leave themselves open to litigation. The best thing to come out of it is that we're all working to the same rules." The Australian Rugby League Commission outlawed the tackle at the end of last year, while New Zealand already had a ban in place for domestic competition. The RFL decided to keep it until a full consultation process had been undertaken, but their hand was forced when the International Federation announced their decision on Tuesday. There have been several high-profile incidents during the opening weeks of the 2013 season. Salford half-back Theo Fages was knocked out by a charge from Catalan Dragons prop Julian Bousquet, while Castleford half-back Rangi Chase was banned for two games for his strike on Leeds full-back Zak Hardaker.